Yashmin joined JPC Law as a Partner in December 2011. As well as their senior enfranchisement specialist, Yashmin is head of JPC’s Property Practice Group. 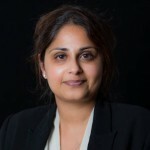 Yashmin, recommended in the Legal 500, specialises in Residential Leasehold and General Landlord and Tenant work, which includes Collective Enfranchisement, Lease Extensions/Variations, Right to Manage claims, Appointment of Manager Applications, Rights of First Refusal and granting new Leases. Yashmin also has experience in dealing with actions before Leasehold Valuation Tribunals, Upper Tribunal, enforcing lease covenants, forfeiture claims, Section 146 notices, and dealing with service charge disputes. In May 2015 Yashmin won “Solicitor of the Year” at the NOTB Enfranchisement and Right to Manage Awards (her second time winning such an accolade). Yashmin has also won “Young Professional of the Year” 2 years in a row, “Regional Solicitor” and has also been short listed for the “Asian Woman of the Year” Award. Yashmin has been an Honorary Legal Consultant and Committee Member for the Federation of Private Residents’ Association (FPRA) since 2009 and regularly writes articles and performs webinars for the FPRA, News on the Block, Flat Living, Housing Quality Network and RICS. Yashmin also contributes to the Dealing with Problems and Service Charges sections on the Isurv Residential website as well as providing guidance and content to Westlaw.